I usually try and avoid posting frumpy photos (fabric not ironed! embroidery on a peg on the fire escape ladder!) but I hope the embroidery makes up for it. ;) I have been working on this for over a month now. Progress is a bit slow due to an aching thumb that is in a brace most of the day and well, the amount of fill stitching is quite overwhelming too. 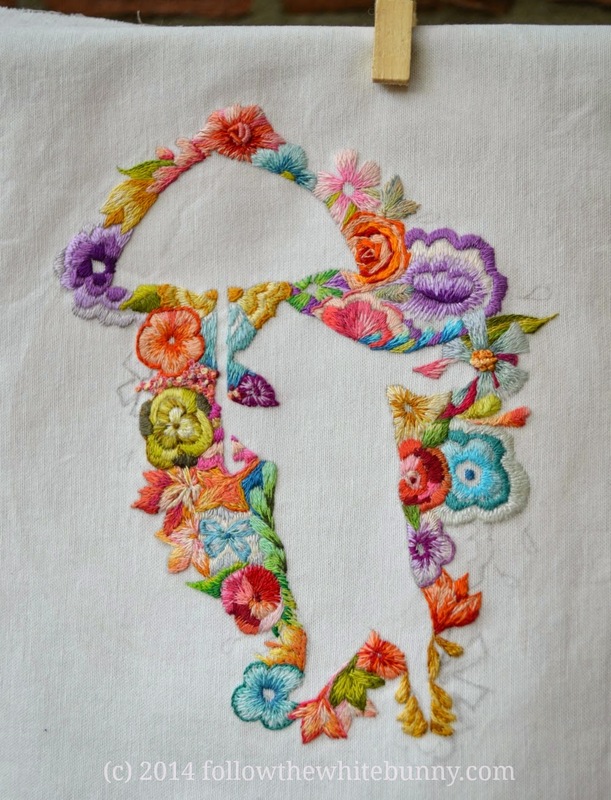 I don't even know how much time I have spent embroidering this piece, surely more than 40 hours... There are parts of this piece that I'm very happy with and there are parts I'm not crazy about but I really do like the overall effect. I also like that it's totally 'me': the subject, the flowers, the obsessive shading and using about every colour available in my stash :) It's nearly completed now and I can't wait to try out more similar ideas. Maybe even as embroidered illustration. Anyway, I expect that some of this will make it's way into the new online class I'm planning for 2015. Hope you all like it. I love it! That is gorgeous. The colors are so beautiful. It is gorgeous! Love all of the color!!!! So lovely ~ you do the most amazing work! Hope your thumb is feeling better soon. It's beautiful. I love the colors and design. Oh fabulous colours and design. Such a lot of work too.